It took Michael McClendon’s parents a while to accept that he wasn’t going to be a doctor, after all. The plan was for the U.T. Tyler grad ’09 and Faulconer scholar to major in biology and then ship off to med school. Michael did in fact graduate with a biology B.A.—plus minors in chemistry and Spanish—but a faculty mentor introduced him to a wholly different vocation along the way. He interned for a summer in the labs of Kiepersol Vineyards and Winery south of Tyler, and was fascinated by “how much science there is in every aspect of wine production,” he says. He’s worked with Kiepersol ever since, and is now the winery’s award-winning in-house enologist and winemaker. Named a Young Turk of Texas wines, the job has taken him all over the world, from Chile to New Zealand. But Michael, who recently co-founded a “custom crush” winery and consultancy in Nacogdoches, says his heart remains in Tyler. “I think East Texas wines are a best-kept secret,” he told me. 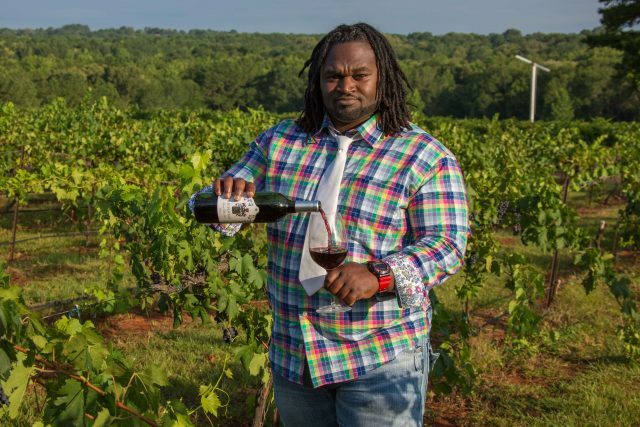 I asked McClendon to back up that claim, talk about his career path, and share what it’s like being a winemaker of color in an overwhelming white industry. Our conversation has been lightly edited and condensed. When I was in college and figuring out my career, I had never spent any time thinking about wine. I didn’t grow up around wine. I didn’t even know there was a winery in Tyler. Like a lot of people who get biology degrees, I thought my options were to go into medicine or something like that. But the department at U.T. does a really good job of exposing students to other parts of biology. The summer before I graduated in 2008, I got a call from the then-department chair of U.T. Tyler’s biology department. He left me a message—this was way back when we had answering machines—asking if I would be interested in a research position. I thought this meant working with him, so I thought, “Sure thing!” When I got to his office, he explained that the position was actually at a local winery. I spent that summer working my first vintage at Kiepersol, and it turned out that all those classes I was taking translated beautifully to the vintner’s lifestyle. I asked Kiepersol if I could stick around during my last year of college. I remember my mama and daddy kind of being like, “You’re not just gonna sit around drinking all day, now are you?” (Laughs.) I would say, “No, no, no, it’s really scientific!” It took a long time to convince my family that what I was doing was legitimate. To them, it was almost a little bit taboo; growing up in small-town East Texas had something to do with it. But they’ve come around. 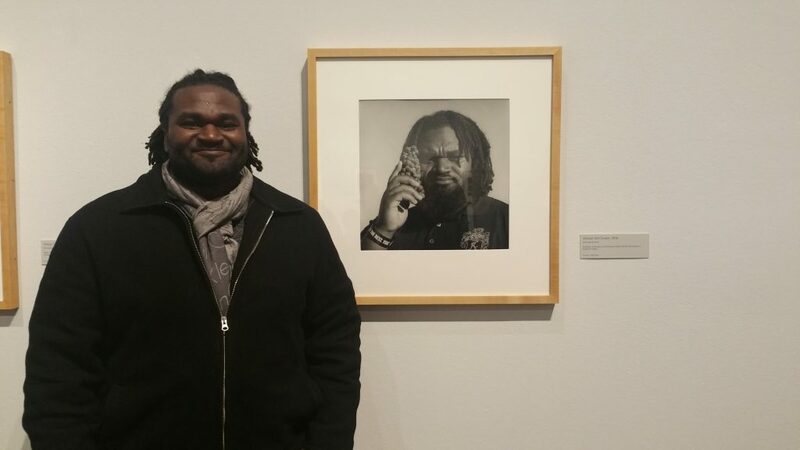 McClendon with a portrait by contemporary local photographer Robert Langham. The portrait is part of the collection “Brickstreet Anthology” and part of the Tyler Museum of Art’s permanent collection. For someone who’s never heard of enology, how would you explain what you do all day? I’m would say I’m a wine scientist, but some parts of winemaking are more like being a glorified janitor. There’a a lot of keeping things clean and sterilized, and keeping different wine lots separate from each other. There’s also the farming aspect of understanding fruit and weather patterns. Some of the finest scientists are farmers, I feel. On a typical day, I’m doing microbiology, I’m doing botany, analytical chemistry, I’m even doing a little bit of junior or amateur meteorological work. Growing up in my little community of Prairie Creek outside Van, I remember hearing stories about how my grandparents and great-grandparents and grand-uncles were farmers. I remember thinking, “Oh man, I cannot wait to grow up and do something that’s not kicking dirt.” (Laughs.) But I’ve gained a real appreciation for the interdisciplinary aspects of it. What do you wish people understood about East Texas wines? I wish people understood that just like how French wines are not the same as Australian wines or Spanish wines, Texas wines also have their own unique terroir. When people taste Texas wine, I hope they have an open mind and are willing to taste and experience Texas wine for what it is—and not compare it to their favorite California cabernet. This is Texas cabernet, Texas syrah, Texas merlot. Same thing when it comes to East Texas wines. As a state, Texas is larger than the entire country of France. We’re used to the idea that the French wine industry has many different regions that are famous for their unique wine production, and people respect those differences. Yet at the same time, people think Texas wine must all be the same. In reality, East Texas wines are very different from West Texas wines or High Plains wines. Our wine seems to be a more comfortable, easier-to-drink style. We’re definitely embracing our terroir, not really pushing over-extraction and these types of stylistics that you get from West Coast fruit. We’re pushing more of an Old World feel with New World fruit-forward flavoring. We’re not interested in competing with other parts of the country so much as representing the way we do wine here in Texas. You’re in a field that’s typically dominated by white professionals. In this age of important conversations about representation and inclusion, what does it mean to you to be a black enologist? I just came back from the annual Texas Wine and Grape Growers Association conference in Irving, and you still get a look or a puzzled face every now and then. You can tell by someone’s body language or their mannerisms that they don’t know quite how to take it when they see me there. That’s where, for me, education has always been the great equalizer. My quality of work speaks for itself. It helps that I’m a point in my career where I’m more known. It’s like, “Hey, that black guy with dreads, he’s really good at doing what he does. He’s one of the best.” In my tenure as wine maker at Kiepersol, we won Top Texas Winery at the 2017 Houston Livestock Show and Rodeo International Wine Competition. Those bits of validation really help out in terms of acknowledgement. But there remains a perception problem that needs to be demystified and broken down. What are you really enjoying in your work right now? I’m excited about a red grape variety called Tannat, which is traditionally used as a blending grape. It’s really big, really full-bodied, and it’s really taken to Texas soil. A few wineries in the Hill country and High Plains areas are working with Tannat, but no one is really growing it in East Texas yet. I’ve had a chance to get my hands on some fruit, and it’s very exciting. I think it has the opportunity to be a stellar grape variety that could really put Texas on the map. Next articleUpdate: Lola’s Handcrafted Sandwiches is coming back!